Big Finish have released episode information for Series Two of Jago and Litefoot, the spin off series featuring two characters originally created by Robert Holmes for the fourth Doctor story, The Talons of Weng-Chiang. The pathology skills of Professor Litefoot and Dr Sacker are called upon by Lord Ruthven, who asks them to catalogue a cache of bones beneath his country estate. And so begins the endgame… as a plan long laid come to its glorious fruition. Series One was released in June. The official site of the Edinburgh International Television Festival has now uploaded several of the sessions from the 2010 festival. The link to the full sessions includes the Question Time with Steven Moffat in which he talks of the BBC licence fee in relation to Doctor Who. There is also a link on the same page to the full Doctor Who Masterclass with Steven Moffat and Karen Gillan talking about their work on the series. In the video Moffat talks about the way he runs the show, his relationship to other writers including former show runner Russell T Davies, and his general love for the show. Gillan talks about the way she was cast and the approach she takes to playing Amy Pond. Moffat confirms that in 2011 he will definitely reveal the identity of River Song. The Press Association has uploaded video from Saturday's appearance of Karen Gillan at Hamleys toy store in Glasgow to promote the release of the Amy Pond action figure. The event was limited to 250 people, which led to a number of complaints from people unable to gain access to the event, somthing picked up by The Glasgow Herald. Sylvester McCoy has enjoyed a return to his home town of Dunoon in his role as this year’s Chieftain at Cowal Highland Gathering, first reported here. He told the local paper, the Argyllshire Standard, that he is in talks for a major role in the upcoming feature film The Hobbit which is due to start filming in 2011. "I am being cast in The Hobbit," he told the paper, "We're currently in negotiations - there are two of us under consideration. It's not the Bilbo role, but could be bigger." Doctor Who featured as a question subject in the long running BBC Two quiz show University Challenge on Monday evening. Contestants were asked to identify different versions of the series theme music and state who played the Doctor when they were broadcast. The quiz is available to UK viewers on the BBC iPlayer for the next seven days. International viewers may find it on YouTube. Speaking at the Edinburgh International Television Festival, Steven Moffat has announced that the next series of Doctor Who will be split in two with a 'gamechanging' cliffhanger in episode 7. "The split series is hugely exciting because viewers will be treated to two premieres, two finales and more event episodes. For the kids it will never be more than a few months to the next Doctor Who! Easter, Autumn, Christmas!!" The BBC press office describe the split transmission as the result of a request from Steven Moffat to write a new Doctor Who story arc which involves a big plot twist in the middle of the series. "By splitting the series Moffat plans to give viewers one of the most exciting Doctor Who cliffhangers and plot twists ever, leaving them waiting, on the edge of their seats, until the autumn to find out what happens." 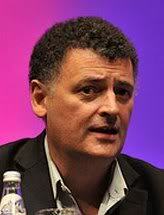 The Guardian, who host the annual television festival, have uploaded a video clip of Moffat making the announcement here. The BBC's internationally broadcast channel BBC Entertainment (formerly BBC Prime) is to start broadcasting the third series of Doctor Who, starring David Tennant and Freema Agyeman, in the Autumn. The channel is currently available to watch in Europe and the Middle East. Following on from the phenomenal success of the first two series that have taken British television by storm, the third installment of Doctor Who is full of new thrills, new laughs, new heartbreak and some terrifying new monsters. From the moment the Doctor (David Tennant) walks into the life of medical student Martha Jones (Freema Agyeman) he changes it forever. Together they find themselves travelling through time and space encountering extraordinary events, amazing worlds and faces both old and new. They come face to face with the ruthless Judoon, a vicious plasmavore and the Doctor's sworn enemies, the Daleks, who have been hiding in 1930s New York with a terrifying plan for humanity. Strangely, BBC Entertainment's home page features David Tennant and Catherine Tate! The BBC have appointed media accountant Alun Jones as the Programme Director for its new Drama Village being built at the Roath Basin, Cardiff. Mr Jones has worked in the media industry for some seventeen years, including HTV and most recently as integration director for the Capital Radio/GWR merger. The drama centre is a unique project in Wales and I am delighted to be joining the team at this stage of a development which, in addition to allowing BBC Wales to build on the success of its current drama productions, also presents a fantastic opportunity for the wider creative industries in Wales. There is an ambitious timetable of work to be completed in the coming year, and I'm confident that it will be achieved through the combination of the outstanding talent within the team and the excellent partnerships that have already been put in place. The Drama Village is expected to be completed during the summer of 2011, with Doctor Who and The Sarah Jane Adventures due to start filming there from 2012 - meaning the former's 50th Anniversary series will be produced at a brand new studio! Previous news items on the Drama Village were reported in January and May. Karen Gillan will join Steven Moffat at the Edinburgh International Television Festival for a question and answer session about Doctor Who. The Masterclass is being held at the Edinburgh International Conference Centre on Sunday morning. Moffat will also appear on the panel for special Question Time on Saturday night alongside Diane Abbott MP and Mariella Frostrup. Update: It was announced Saturday that the Steven Moffat and Mark Gatiss production of Sherlock has been recommissioned by BBC One controller Jay Hunt. There will be three new 90-minute episodes in Autumn 2011. Talking of the Sherlock recommission, Gatiss and Moffat, said: "We've been overwhelmed by the warmth of response to our new Sherlock Holmes and John Watson and can't wait to take them on three new adventures next year. There'll be baffling new puzzles, old friends and new enemies – whether on two, or four legs. And we might well be seeing the cold master of logic and reason unexpectedly falling. But in love? Or over a precipice? Who can tell?" David Tennant has been listed as one of the top ten Hamlets by The Guardian newspaper. Tennant, who played the role in Stratford and London in 2008, was described as sardonic and volatile, a Hamlet so graceful that at times he seemed almost to dance across the stage. BBC4 is to dramatise Douglas Adams's 1987 novel about anti-hero Dirk Gently. Adams was Script Editor for Season 17 of Doctor Who and wrote The Pirate Planet and co-wrote City of Death. He was writing a third Dirk Gently book, The Salmon of Doubt, at the time of his death in 2001. The books have formed the basis of a play and a BBC Radio 4 series but have never before been filmed for Television. Andrew Smith has been talking to the Rutherglen Reformer about his return to Doctor Who and his new script for Big Finish Productions. Smith wrote the 1980 Fourth Doctor story Full Circle. The new story is called The Invasion of E-Space and once more features Lalla Ward as Romana. Smith told the Reformer: "I wrote the first draft, sent it off, and I didn’t hear back for a little while. I was getting really paranoid as I had no idea how it had gone down, but I was quite relieved when they got back to me and said they loved it." BBC Director General Mark Thompson has told the Edinburgh International Television Festival the corporation is aiming to launch an international commercial version of the BBC iPlayer within a year. The plans, which are subject to approval by the BBC Trust, will hopefully allow viewers around the world to watch BBC programmes, including Doctor Who, Torchwood and The Sarah Jane Adventures, soon after their UK transmission. There are also plans to develop a way for UK licence fee payers and British servicemen and women around the world to gain access to a version of the UK public service iPlayer. The BBC Chief used the MacTaggart Lecture to defend the BBC following criticism from many of its competitors, such as James Murdoch who gave last year's key note speech to the festival. The speech has already been attacked by The Telegraph who singled out the free downloads of Doctor Who computer games, such as yesterday's release of The Doctor Who Adventures, as something the BBC has no business doing. The BBC has announced that extra content showing behind the scenes material from the Doctor Who Prom will be available to UK viewers via the Red Button service. 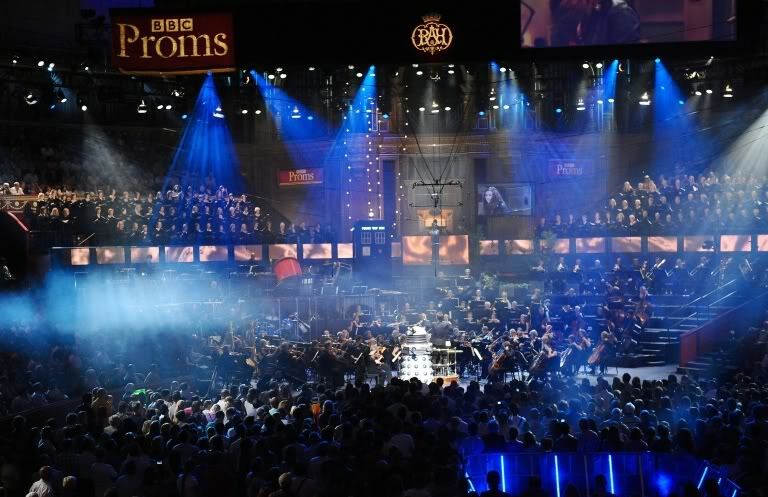 Described as a VIP access-all-areas view of the Prom which took place last month, the material will include interviews with Matt Smith, Karen Gillan and Arthur Darvill and follow their preparations as they get ready to take the stage. The service will begin on Monday 6th September, the same day the Prom is broadcast on BBC Three. Red Button viewers will also be able to see music cut from the main BBC Three transmission as well as a look at the audience through the eyes of some of the Doctor Who aliens. 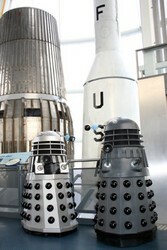 The National Space Centre in the Midlands will be playing host to an invasion of Daleks on the 11th-12th September, to help raise money for Children in Need. Daleks have become part of modern culture and we have all grown up with them. I think this event will be the perfect time for everybody to come out from behind the sofa and enjoy a family day out that will dispel all those memories of fear. The event will also see appearances by guests from Doctor Who; Ruaru Mears (various monsters) will be there on the Saturday, Nina De Cosimo (Blanche in Victory Of The Daleks) and Sonila Vjeshta (Vampire girl in The Vampires of Venice) on the Sunday. More guests are expected and will be announced nearer the date. The Hyde Fundraisers will also be in attendance, who will be hosting a sculpting demonstration as well as bringing a range of adversaries to the proceedings! For more information see the National Space Museum's event page. The TARDIS has materialised on top of Little Dome at the Massachusetts Institute of Technology. 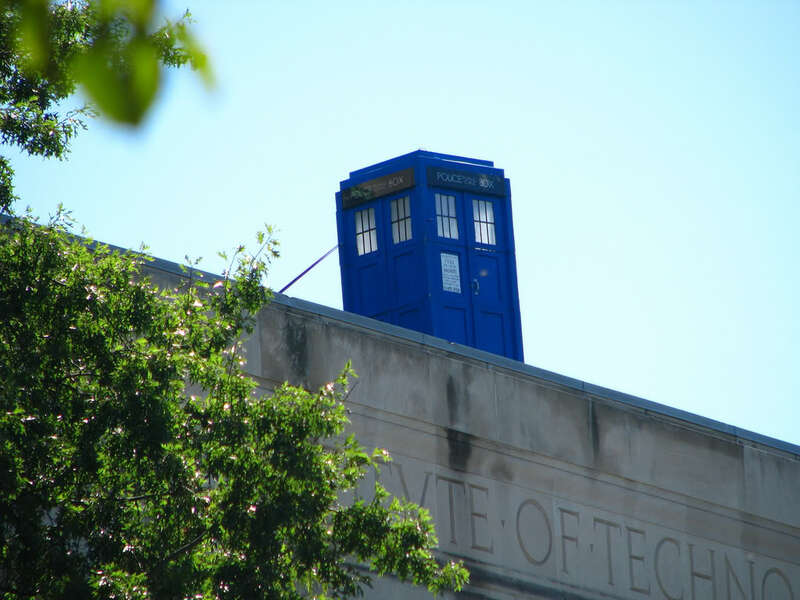 The appearance of the Time machine on the roof of the University located in Cambridge, Massachusetts is a "hack" or a practical joke. The University has a long history of "hacks" including placing a Dark Mark over the Student Center to celebrate the release of Harry Potter and the Deathly Hallows and placing a Fire Department truck on the roof of the Great Dome. Doctor Who directors Richard Clark and Adam Smith will return to the series in 2011. Both are listed in the online CV of new Production Designer Michael Pickwoad. They are listed alongside Toby Haynes who is already confirmed as director of the 2010 Christmas Special. Richard Clark directed Gridlock and The Lazarus Experiment, both originally shown in 2007 as part of the third series since the revival. He has also worked on episodes of Life on Mars, The Whistleblowers and Gunrush. Adam Smith directed the Eleventh Doctor's first story, The Eleventh Hour as well as the Weeping Angels two-part story The Time of Angels / Flesh and Stone. Away from Doctor Who he has worked on Little Dorrit and Skins. Production on the next series of Doctor Who is due to continue next week, with a read-through of the Neil Gaiman story. Issue 181 of Doctor Who Adventures comes with a back-to-school monster stationery set. There is a Cyberman fact file, a vital guide to all the horrible Cybermen out there. Plus, a chance to win life-size cardboard cutouts of the Doctor, Amy, the TARDIS, a Dalek Drone or a Weeping Angel. Also this week, ‘"A day in the life of a... MONSTER MOVER"’: all the backstage info from Alisa Berk, who tells what it’s like to choreograph creepy creatures. Plus a new ‘Monster Laughs’ jokes feature and 3 posters. The third instalment of Doctor Who: The Adventure Games is due to be released tomorrow (27th August), and writer James Moran has written a preview mini-adventure Wish You Were Here. TARDIS is a dramatic, non-stop story in which you get to take control of the Doctor's time machine and battle a new monster known as the Entity... But if you want to know what the Doctor and Amy are up to immediately before that adventure begins, you can find out now in Wish You Were Here. 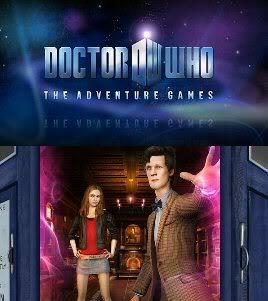 It's written by James Moran (The Fires of Pompeii, Torchwood) who also wrote the latest Adventure Game. It sets the scene for TARDIS, introduces a new threat faced by the Doctor and leads directly into the action of the game. You can download the mini-adventure (PDF format) from the BBC website, and find out all the details about the new adventure, screensavers, a 360° panorama, etc. - and of course download from tomorrow - from their TARDIS section.